Fang the Wonder Dog delivers a case to Tara's flat. From it emerges Steed's voice asking that she take care of the dog. Unfortunately, she has left an identical case behind which explains that she can't take the dog. A red suitcase containing a hefty sum of money, not to mention a bomb as a security device, is giving people orders—where to take it and when. Believing it is headed for "Mr. Big," Mother puts Steed and Tara in charge of tracking the case—which leads them straight back to Mother! A jolly fun ride, this one, with some clever twists, and the only thing keeping it from full-four-bowler status is that we know who "Mr. Big" is a half-hour before our heroes do. 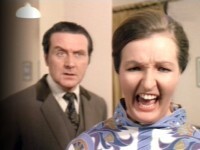 If nothing else, it's worth it for Penelope Keith's ear-shattering scene. 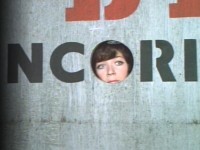 According to Tony McKay, the script very likely had Steed as Tara's partner in the "duck blind" at the airfield. Word is that Macnee was unavailable for the shot, and so it was re-written with another character—but apparently not before some of the photography had already been completed. Note that we see Captain Andrew getting into the bubble car, whereas a bowler-wearing double is seen driving it. 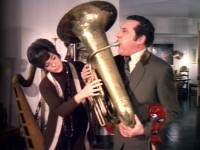 Pablo Alonso notes that Terry Nation reused the trick of a case with a bomb as the plot device in The Persuaders episode, "Chain of Events." The x-ray of the case is recycled in "Thingumajig." Also, Mother refers to Grandmother in the opening scene. Michael Hawkins appeared in two Police Surgeon episodes, "Wilful Neglect" and "The Bigger They Are." After finally sending the little children of her class out of the room "back to their cages," Penelope Keith releases an ear-shattering primal scream.